An 18th-century Persian astrolabe, kept at the Whipple Museum of the History of Science in Cambridge, England. Islamic astronomy comprises the astronomical developments made in the Islamic world, particularly during the Islamic Golden Age (9th–13th centuries), and mostly written in the Arabic language. These developments mostly took place in the Middle East, Central Asia, Al-Andalus, and North Africa, and later in the Far East and India. It closely parallels the genesis of other Islamic sciences in its assimilation of foreign material and the amalgamation of the disparate elements of that material to create a science with Islamic characteristics. These included Greek, Sassanid, and Indian works in particular, which were translated and built upon. Islamic astronomy played a significant role in the revival of Byzantine and European astronomy following the loss of knowledge during the early medieval period, notably with the production of Latin translations of Arabic works during the 12th century. Islamic astronomy also had an influence on Chinese astronomy and Malian astronomy. A significant number of stars in the sky, such as Aldebaran, Altair and Deneb, and astronomical terms such as alidade, azimuth, and nadir, are still referred to by their Arabic names. A large corpus of literature from Islamic astronomy remains today, numbering approximately 10,000 manuscripts scattered throughout the world, many of which have not been read or catalogued. Even so, a reasonably accurate picture of Islamic activity in the field of astronomy can be reconstructed. Ahmad Dallal notes that, unlike the Babylonians, Greeks, and Indians, who had developed elaborate systems of mathematical astronomical study, the pre-Islamic Arabs relied entirely on empirical observations. These observations were based on the rising and setting of particular stars, and this area of astronomical study was known as anwa. Anwa continued to be developed after Islamization by the Arabs, where Islamic astronomers added mathematical methods to their empirical observations. According to David King, after the rise of Islam, the religious obligation to determine the qibla and prayer times inspired more progress in astronomy for centuries. Following the Islamic conquests, under the early caliphate, Muslim scholars began to absorb Hellenistic and Indian astronomical knowledge via translations into Arabic (in some cases via Persian). The first astronomical texts that were translated into Arabic were of Indian and Persian origin. The most notable of the texts was Zij al-Sindhind,[a] an 8th-century Indian astronomical work that was translated by Muhammad ibn Ibrahim al-Fazari and Yaqub ibn Tariq after 770 CE with the assistance of Indian astronomers who visited the court of caliph Al-Mansur in 770. Another text translated was the Zij al-Shah, a collection of astronomical tables (based on Indian parameters) compiled in Sasanid Persia over two centuries. Fragments of texts during this period indicate that Arabs adopted the sine function (inherited from India) in place of the chords of arc used in Greek trigonometry. The Tusi-couple is a mathematical device invented by Nasir al-Din al-Tusi in which a small circle rotates inside a larger circle twice the diameter of the smaller circle. Rotations of the circles cause a point on the circumference of the smaller circle to oscillate back and forth in linear motion along a diameter of the larger circle. The House of Wisdom was an academy established in Baghdad under Abbasid caliph Al-Ma'mun in the early 9th century. From this time, independent investigation into the Ptolemaic system became possible. According to Dallal (2010), the use of parameters, sources and calculation methods from different scientific traditions made the Ptolemaic tradition "receptive right from the beginning to the possibility of observational refinement and mathematical restructuring". Astronomical research was greatly supported by the Abbasid caliph al-Mamun through The House of Wisdom. Baghdad and Damascus became the centers of such activity. The caliphs not only supported this work financially, but endowed the work with formal prestige. The first major Muslim work of astronomy was Zij al-Sindh by al-Khwarizmi in 830. The work contains tables for the movements of the Sun, the Moon and the five planets known at the time. The work is significant as it introduced Ptolemaic concepts into Islamic sciences. This work also marks the turning point in Islamic astronomy. Hitherto, Muslim astronomers had adopted a primarily research approach to the field, translating works of others and learning already discovered knowledge. Al-Khwarizmi's work marked the beginning of nontraditional methods of study and calculations. In 850, al-Farghani wrote Kitab fi Jawani (meaning "A compendium of the science of stars"). The book primarily gave a summary of Ptolemic cosmography. However, it also corrected Ptolemy based on findings of earlier Arab astronomers. Al-Farghani gave revised values for the obliquity of the ecliptic, the precessional movement of the apogees of the Sun and the Moon, and the circumference of the Earth. The book was widely circulated through the Muslim world, and even translated into Latin. An illustration from al-Biruni's astronomical works, explains the different phases of the Moon. The period when a distinctive Islamic system of astronomy flourished. The period began as the Muslim astronomers began questioning the framework of the Ptolemaic system of astronomy. These criticisms, however, remained within the geocentric framework and followed Ptolemy's astronomical paradigm; one historian described their work as "a reformist project intended to consolidate Ptolemaic astronomy by bringing it into line with its own principles." Between 1025 and 1028, Ibn al-Haytham wrote his Al-Shukuk ala Batlamyus (meaning "Doubts on Ptolemy"). While maintaining the physical reality of the geocentric model, he criticized elements of the Ptolemic models. Many astronomers took up the challenge posed in this work, namely to develop alternate models that resolved these difficulties. In 1070, Abu Ubayd al-Juzjani published the Tarik al-Aflak. In his work, he indicated the so-called "equant" problem of the Ptolemic model. Al-Juzjani even proposed a solution for the problem. In Al-Andalus, the anonymous work al-Istidrak ala Batlamyus (meaning "Recapitulation regarding Ptolemy"), included a list of objections to the Ptolemic astronomy. Notable astronomers from the later medieval period include Mu'ayyad al-Din al-'Urdi (c. 1266), Nasir al-Din al-Tusi (1201–74), Qutb al-Din al Shirazi (c. 1311), Sadr al-Sharia al-Bukhari (c. 1347), Ibn al-Shatir (c. 1375), and Ali al-Qushji (c. 1474). In the fifteenth century, the Timurid ruler Ulugh Beg of Samarkand established his court as a center of patronage for astronomy. He himself studied it in his youth, and in 1420 ordered the construction of an observatory, which produced a new set of astronomical tables, as well as contributing to other scientific and mathematical advances. Layout of the Beijing Ancient Observatory. Islamic influence on Chinese astronomy was first recorded during the Song dynasty when a Hui Muslim astronomer named Ma Yize introduced the concept of seven days in a week and made other contributions. Islamic astronomers were brought to China in order to work on calendar making and astronomy during the Mongol Empire and the succeeding Yuan Dynasty. The Chinese scholar Yeh-lu Chu'tsai accompanied Genghis Khan to Persia in 1210 and studied their calendar for use in the Mongol Empire. Kublai Khan brought Iranians to Beijing to construct an observatory and an institution for astronomical studies. Several Chinese astronomers worked at the Maragheh observatory, founded by Nasir al-Din al-Tusi in 1259 under the patronage of Hulagu Khan in Persia. One of these Chinese astronomers was Fu Mengchi, or Fu Mezhai. In 1267, the Persian astronomer Jamal ad-Din, who previously worked at Maragha observatory, presented Kublai Khan with seven Persian astronomical instruments, including a terrestrial globe and an armillary sphere, as well as an astronomical almanac, which was later known in China as the Wannian Li ("Ten Thousand Year Calendar" or "Eternal Calendar"). He was known as "Zhamaluding" in China, where, in 1271, he was appointed by Khan as the first director of the Islamic observatory in Beijing, known as the Islamic Astronomical Bureau, which operated alongside the Chinese Astronomical Bureau for four centuries. Islamic astronomy gained a good reputation in China for its theory of planetary latitudes, which did not exist in Chinese astronomy at the time, and for its accurate prediction of eclipses. 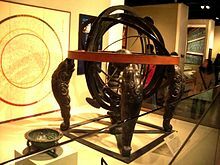 Some of the astronomical instruments constructed by the famous Chinese astronomer Guo Shoujing shortly afterwards resemble the style of instrumentation built at Maragheh. In particular, the "simplified instrument" (jianyi) and the large gnomon at the Gaocheng Astronomical Observatory show traces of Islamic influence. While formulating the Shoushili calendar in 1281, Shoujing's work in spherical trigonometry may have also been partially influenced by Islamic mathematics, which was largely accepted at Kublai's court. These possible influences include a pseudo-geometrical method for converting between equatorial and ecliptic coordinates, the systematic use of decimals in the underlying parameters, and the application of cubic interpolation in the calculation of the irregularity in the planetary motions. Hongwu Emperor (r. 1368-1398) of the Ming Dynasty (1328–1398), in the first year of his reign (1368), conscripted Han and non-Han astrology specialists from the astronomical institutions in Beijing of the former Mongolian Yuan to Nanjing to become officials of the newly established national observatory. That year, the Ming government summoned for the first time the astronomical officials to come south from the upper capital of Yuan. There were fourteen of them. In order to enhance accuracy in methods of observation and computation, Hongwu Emperor reinforced the adoption of parallel calendar systems, the Han and the Hui. In the following years, the Ming Court appointed several Hui astrologers to hold high positions in the Imperial Observatory. They wrote many books on Islamic astronomy and also manufactured astronomical equipment based on the Islamic system. The translation of two important works into Chinese was completed in 1383: Zij (1366) and al-Madkhal fi Sina'at Ahkam al-Nujum, Introduction to Astrology (1004). In 1384, a Chinese astrolabe was made for observing stars based on the instructions for making multi-purposed Islamic equipment. In 1385, the apparatus was installed on a hill in northern Nanjing. Around 1384, during the Ming Dynasty, Hongwu Emperor ordered the Chinese translation and compilation of Islamic astronomical tables, a task that was carried out by the scholars Mashayihei, a Muslim astronomer, and Wu Bozong, a Chinese scholar-official. These tables came to be known as the Huihui Lifa (Muslim System of Calendrical Astronomy), which was published in China a number of times until the early 18th century, though the Qing Dynasty had officially abandoned the tradition of Chinese-Islamic astronomy in 1659. The Muslim astronomer Yang Guangxian was known for his attacks on the Jesuit's astronomical sciences. In the early Joseon period, the Islamic calendar served as a basis for calendar reform owing to its superior accuracy over the existing Chinese-based calendars. A Korean translation of the Huihui Lifa, a text combining Chinese astronomy with Islamic astronomy works of Jamal ad-Din, was studied in Korea under the Joseon Dynasty during the time of Sejong in the 15th century. The tradition of Chinese-Islamic astronomy survived in Korea up until the early 19th century. Medieval manuscript by Qutb al-Din al-Shirazi depicting an epicyclic planetary model. The first systematic observations in Islam are reported to have taken place under the patronage of al-Mamun. Here, and in many other private observatories from Damascus to Baghdad, meridian degrees were measured, solar parameters were established, and detailed observations of the Sun, Moon, and planets were undertaken. In the 10th century, the Buwayhid dynasty encouraged the undertaking of extensive works in astronomy, such as the construction of a large-scale instrument with which observations were made in the year 950. We know of this by recordings made in the zij of astronomers such as Ibn al-Alam. The great astronomer Abd Al-Rahman Al Sufi was patronised by prince Adud o-dowleh, who systematically revised Ptolemy's catalogue of stars. Sharaf al-Daula also established a similar observatory in Baghdad. Reports by Ibn Yunus and al-Zarqall in Toledo and Cordoba indicate the use of sophisticated instruments for their time. It was Malik Shah I who established the first large observatory, probably in Isfahan. It was here where Omar Khayyám with many other collaborators constructed a zij and formulated the Persian Solar Calendar a.k.a. the jalali calendar. A modern version of this calendar is still in official use in Iran today. The most influential observatory was however founded by Hulegu Khan during the 13th century. Here, Nasir al-Din al-Tusi supervised its technical construction at Maragha. The facility contained resting quarters for Hulagu Khan, as well as a library and mosque. Some of the top astronomers of the day gathered there, and from their collaboration resulted important modifications to the Ptolemaic system over a period of 50 years. The Ulugh Beg Observatory in Samarqand. In 1420, prince Ulugh Beg, himself an astronomer and mathematician, founded another large observatory in Samarkand, the remains of which were excavated in 1908 by Russian teams. And finally, Taqi al-Din Muhammad ibn Ma'ruf founded a large observatory in Ottoman Constantinople in 1577, which was on the same scale as those in Maragha and Samarkand. The observatory was short-lived however, as opponents of the observatory and prognostication from the heavens prevailed and the observatory was destroyed in 1580. While the Ottoman clergy did not object to the science of astronomy, the observatory was primarily being used for astrology, which they did oppose, and successfully sought its destruction. Work in the observatorium of Taqi al-Din. Our knowledge of the instruments used by Muslim astronomers primarily comes from two sources: first the remaining instruments in private and museum collections today, and second the treatises and manuscripts preserved from the Middle Ages. Muslim astronomers of the "Golden Period" made many improvements to instruments already in use before their time, such as adding new scales or details. Celestial globes were used primarily for solving problems in celestial astronomy. Today, 126 such instruments remain worldwide, the oldest from the 11th century. The altitude of the Sun, or the Right Ascension and Declination of stars could be calculated with these by inputting the location of the observer on the meridian ring of the globe. An armillary sphere had similar applications. No early Islamic armillary spheres survive, but several treatises on "the instrument with the rings" were written. In this context there is also an Islamic development, the spherical astrolabe, of which only one complete instrument, from the 14th century, has survived. Brass astrolabes were a Hellenistic invention. The first Islamic astronomer reported as having built an astrolabe is Muhammad al-Fazari (late 8th century). Astrolabes were popular in the Islamic world during the "Golden Age", chiefly as an aid to finding the qibla. The earliest known example is dated to 927/8 (AH 315). The instruments were used to read the time of rise of the Sun and fixed stars. al-Zarqali of Andalusia constructed one such instrument in which, unlike its predecessors, did not depend on the latitude of the observer, and could be used anywhere. This instrument became known in Europe as the Saphea. Abu Rayhan Biruni made an instrument he called "Box of the Moon", which was a mechanical lunisolar calendar, employing a gear train and eight gear-wheels. This was an early example of a fixed-wired knowledge processing machine. The Timbuktu Manuscripts showing both mathematics and astronomy. Muslims made several important improvements[which?] to the theory and construction of sundials, which they inherited from their Indian and Greek predecessors. Khwarizmi made tables for these instruments which considerably shortened the time needed to make specific calculations. Sundials were frequently placed on mosques to determine the time of prayer. One of the most striking examples was built in the 14th century by the muwaqqit (timekeeper) of the Umayyad Mosque in Damascus, ibn al-Shatir. Ibn al-Shatir's model for the appearances of Mercury, showing the multiplication of epicycles using the Tusi-couple, thus eliminating the Ptolemaic eccentrics and equant. Several forms of quadrants were invented by Muslims. Among them was the sine quadrant used for astronomical calculations, and various forms of the horary quadrant, used to determine time (especially the times of prayer) by observations of the Sun or stars. A center of the development of quadrants was ninth-century Baghdad. The Equatorium is an Islamic invention from Al-Andalus. The earliest known was made in the 11th century. It is a mechanical device for finding the positions of the moon, sun, stars and planets, without calculation using a geometrical model to represent the celestial body's mean and anomalistic position. ^ This book is not related to al-Khwarizmi's Zij al-Sindh. On zijes see E. S. Kennedy, "A Survey of Islamic Astronomical Tables". ^ Leichter, Joseph (May 2004). The Zij as-Sanjari of Gregory Chioniades. Internet Archive. Providence, RI: Brown University (published 27 June 2009). Retrieved 11 November 2016. ^ a b c d Benno, van Dalen (2002). Ansari, S.M. Razaullah, ed. Islamic Astronomical Tables in China: The Sources for Huihui li. History of Oriental Astronomy. Astrophysics and Space Science Library. 274. Astrophysics and Space Science Library. pp. 19–32. doi:10.1007/978-94-015-9862-0. ISBN 978-94-015-9862-0. Retrieved 11 November 2016. ^ Holbrook, Jarita; Medupe, Rodney Thebe; Urama, Johnson O., eds. (1 January 2008). African Cultural Astronomy: Current Archaeoastronomy and Ethnoastronomy research in Africa. Springer Science & Business Media. ISBN 9781402066399. Retrieved 11 November 2016. ^ Medupe, Rodney Thebe; Warner, Brian; Jeppie, Shamil; Sanogo, Salikou; Maiga, Mohammed; Maiga, Ahmed; Dembele, Mamadou; Diakite, Drissa; Tembely, Laya; Kanoute, Mamadou; Traore, Sibiri; Sodio, Bernard; Hawkes, Sharron (2008), "The Timbuktu Astronomy Project", African Cultural Astronomy, Astrophysics and Space Science Proceedings, 6, p. 179, Bibcode:2008ASSP....6..179M, doi:10.1007/978-1-4020-6639-9_13, ISBN 978-1-4020-6638-2. ^ Lebling, Robert W. (September–October 2010). "Arabic in the Sky". aramcoworld.com. Saudi Aramco World. pp. 24–33. Retrieved 11 November 2016. ^ King, David A. (2005-06-30). In Synchrony with the Heavens, Studies in Astronomical Timekeeping and Instrumentation in Medieval Islamic Civilization: The Call of the Muezzin. 1. Brill Academic Pub. p. xvii. ISBN 978-90-04-14188-9. And it so happens that the particular intellectual activity that inspired these materials is related to the religious obligation to pray at specific times. The material presented here makes nonsense of the popular modern notion that religion inevitably impedes scientific progress, for in this case, the requirements of the former actually inspired the progress of the latter for centuries. ^ a b Sachau, Edward, ed. (1910), Alberuni's India: An Account of the Religion, Philosophy, Literature, Geography, Chronology, Astronomy, Customs, Laws and Astrology of India about A.D. 1030, 1, London: Kegan Paul, Trench, Trübner, p. xxxi, It was on this occasion [in the eighth century] that the Arabs first became acquainted with a scientific system of astronomy. They learned from Brahmagupta earlier than from Ptolemy. ^ Dallal, Ahmad (2010). Islam, Science, and the Challenge of History. Yale University Press. p. 29. ISBN 978-0-300-15911-0. ^ Dallal, Ahmad S. (2010). Islam, Science, and the Challenge of History. United States: Yale University Press. p. 31. ISBN 978-0-300-15911-0. Retrieved 11 November 2016. ^ Stirone, Shannon. "How Islamic scholarship birthed modern astronomy". Astronomy.com. Retrieved 24 July 2018. ^ Sabra, A.I. (Fall 1998). "Configuring the Universe: Aporetic, Problem Solving, and Kinematic Modeling as Themes of Arabic Astronomy". Perspectives on Science. 6:3: 322. Retrieved 11 November 2016. ^ Subtelny, Maria E. (2010). "Tamerlane and his descendants: from paladins to patrons". In Morgan, David O.; Reid, Anthony. The New Cambridge History of Islam, Volume 3: The Eastern Islamic World, Eleventh to Eighteenth Centuries. Cambridge: Cambridge University Press. pp. 184–5. ISBN 978-0-521-85031-5. ^ Meuleman, Johan (30 September 2005). Islam in the Era of Globalization: Muslim Attitudes Towards Modernity and Identity. Routledge. ISBN 9781135788292. Retrieved 11 November 2016. ^ a b c vande Walle, Willy (2003). vande Walle, W.F. ; Golvers, Noel, eds. The history of the relations between the Low Countries and China in the Qing era (1644-1911). Leuven University Press. p. 38. ISBN 978-90-5867-315-2. Retrieved 11 November 2016. ^ Zhu, Siben; Walter Fuchs (1946). The "Mongol Atlas" of China. Taipei: Fu Jen Catholic University. ^ Ho, Peng Yoke. (2000). Li, Qi, and Shu: An Introduction to Science and Civilization in China, p. 105. Mineola: Dover Publications. ISBN 0-486-41445-0. ^ Baker, Don (Winter 2006). "Islam Struggles for a Toehold in Korea". Harvard Asia Quarterly. Archived from the original on 2007-05-17. Retrieved 2007-04-23. ^ Yunli Shi (January 2003). "The Korean Adaptation of the Chinese-Islamic Astronomical Tables". Archive for History of Exact Sciences. 57 (1): 25–60 [26–7]. doi:10.1007/s00407-002-0060-z. ISSN 1432-0657. ^ El-Rouayheb, Khaled (2008). "The Myth of "The Triumph of Fanaticism" in the Seventeenth-Century Ottoman Empire". Die Welt des Islams. 48: 196–221. ^ Richard Nelson Frye: Golden Age of Persia. p. 163. ^ Tuncer Oren (2001). "Advances in Computer and Information Sciences: From Abacus to Holonic Agents", Turk J Elec Engin 9 (1): 63–70 . ^ Verde, Tom (September 2011). "Saudi Aramco World :From Africa, in Ajami". saudiaramcoworld.com. Aramco World. Archived from the original on 2014-11-30. Retrieved 11 November 2016. ^ David A. King, "Islamic Astronomy," pp. 168–9. ^ David A. King, Islamic Astronomy, pp. 167–8. "Tubitak Turkish National Observatory Antalya"